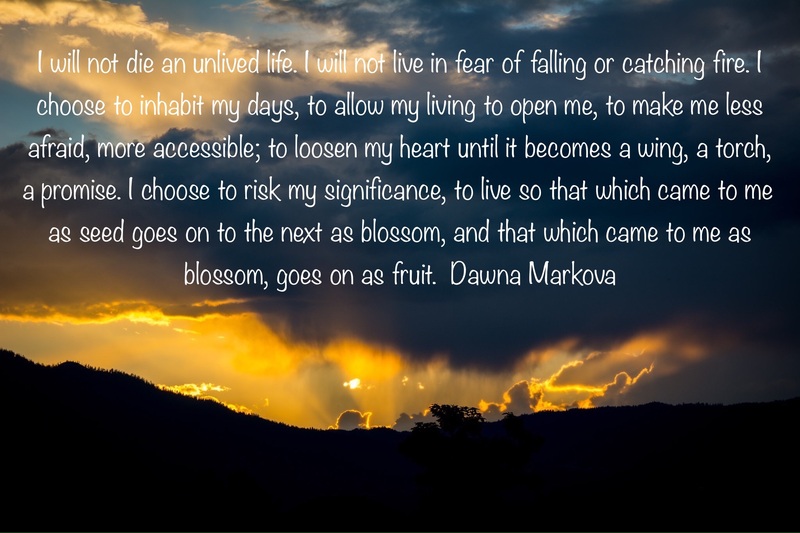 I made a decision long ago to not die an unlived life. Growing up, I watched some of the people I cared about in my life limit themselves. Their favorite phrases seemed to be, "I can't do that!" And they were always coming up with reasons why they couldn't do that. It affected everything from driving at night to achieving wonderful things to simply having peace in life. On some level at the time, I recognized that it was fear that was holding them back. Fear of the unknown, fear of "what ifs" and "yeah buts." As I moved through adulthood, I eventually learned that fear is a pervasive attitude that will indeed hold us back in life, and that it was fear that kept me from being and doing all that I wanted to be and do. Then, I found that a process of introspection coupled with personal responsibility and deepened by spirituality worked to eliminate fear from my life. Am I fear free? No, not by a long shot. And fear is not some boogeyman to be eliminated at all costs. Fear is indeed a wayshower, our fear has messages for us, and if we can learn from that fear, and then eliminate it so it doesn't limit us, life gets to be pretty amazing. So today I wish for you a life of abundance and no limits. I wish for you a life filled with everything you wish to be, and everything you wish to do. A life in which you say, 'Yes, I'm going for it!" Rather than "I can't do that!" Next article:Are you stepping forward?